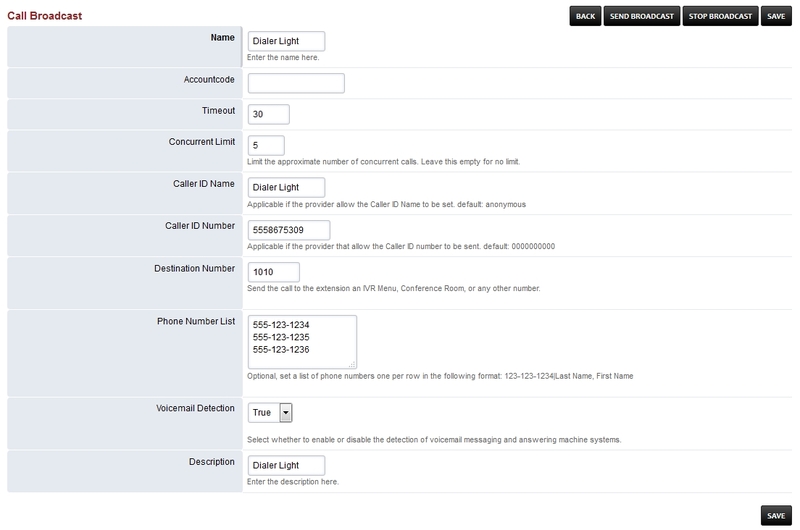 Broadcast calls (a light dialer) to a defined list of phone numbers. Name- Name for the Call Broadcast. Accountcode Used by some billing systems. Timeout- Amount of time till hangup. limit is 100 then we would schedule 100 calls every 60 seconds. Caller ID Name- Name that will be used on outbound caller id. Caller ID Number- Number that will be used on outbound caller id. some other number. If sending to a conference room make sure the room has a pin number or something that requires user input you don’t want to add voiemail messages into the conference room. Phone Number List- List of phone numbers to call in the call broadcast. Voicemail Detection- Set True or false to detect an answering machine. Description Help organize and label what the call broadcast is for. Once you have everything filled out click the Call Broadcast name you just created. On the top right click the Send Broadcast button to start the call broadcast. To stop the call broadcast click STOP BROADCAST on the top right. Uses sched_api to schedule an API call in the future. Is used to schedule calls to the provided number/extensions and send them to the extension an IVR Menu, Conference Room, or any other number. Could be used among other things to schedule a Conference.